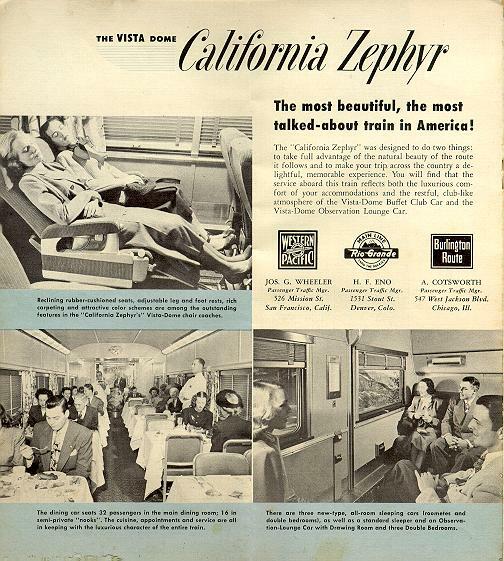 Introducing the California Zephyr "The new California Zephyr brings exciting innovations to train travel. 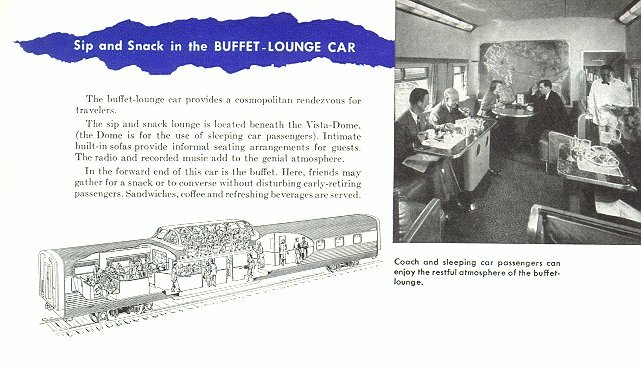 This transcontinental luxury train -- Diesel-powered, streamlined and built of gleaming stainless steel -- provides new thrills and new pleasure to the fortunate travelers who ride it." 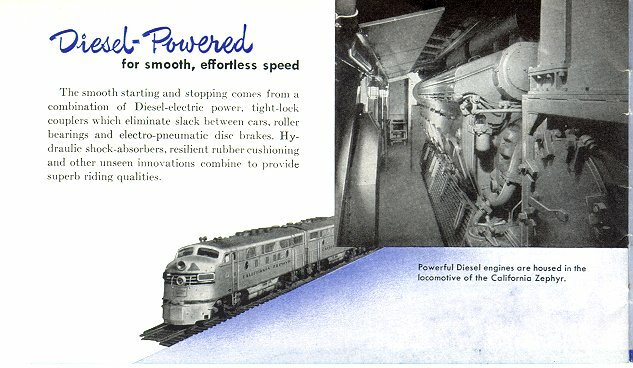 This pre-inaugural brochure has 6 panels that describe the features of each car, as well as the locomotives ("Diesel-powered for smooth, effortless speed"). 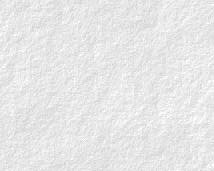 Printers bug indicates either a February or May 1949 printing. 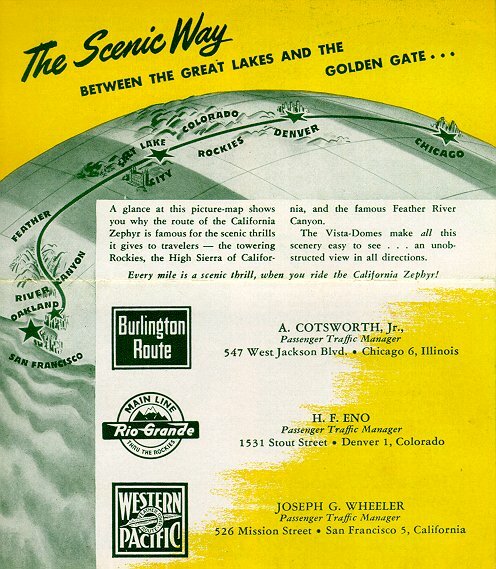 Back cover...picture map of "The Scenic Way between the Great Lakes and The Golden Gate"
The California Zephyr This booklet describes the different cars on the train, and has a cut-a-way drawing of each. 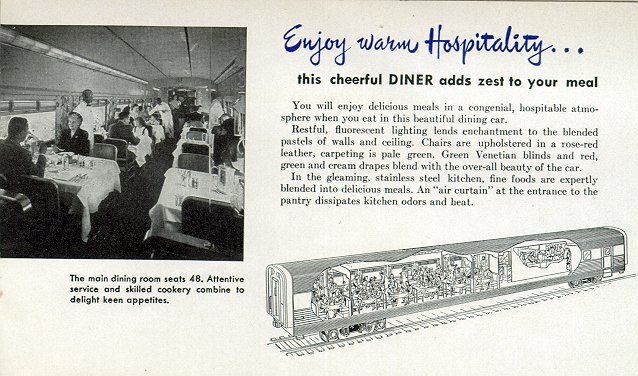 There is no date info in this booklet, but by the railroad passenger agents listed, it appears that it was printed before 1954. 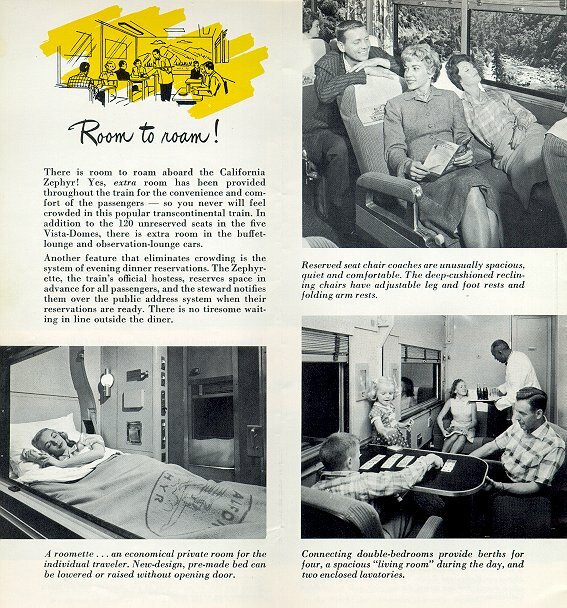 The introduction reads, "Travelers between Chicago and San Francisco may now enjoy the comforts and conveniences of one of America's finest trains...the California Zephyr. 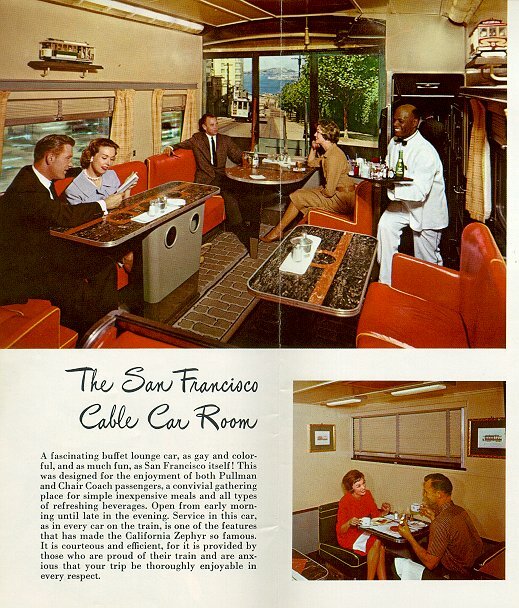 Built of gleaming stainless steel, each of the six luxury trains required to provide daily service consists of a lounge-observation car with Vista-Dome; three all-room sleeping cars (one between New York and San Francisco); a distinctively-styled sleeping car with sixteen semi-private sections; a dining car; a buffet-lounge and three coaches, each with a Vista-Dome; and a Diesel locomotive. 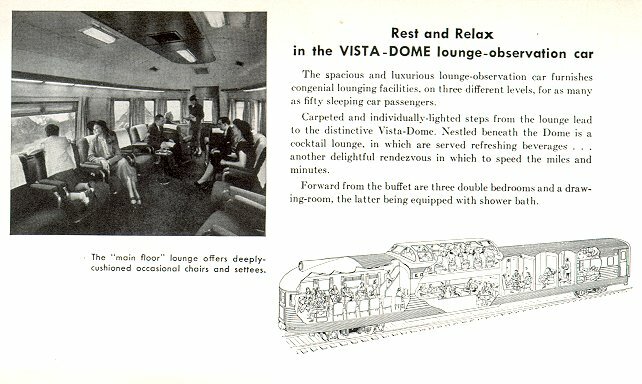 By far the most outstanding of many innovations are the spacious Vista-Domes built into the roofs of each of the thee coaches, lounge- observation and buffet-lounge cars. 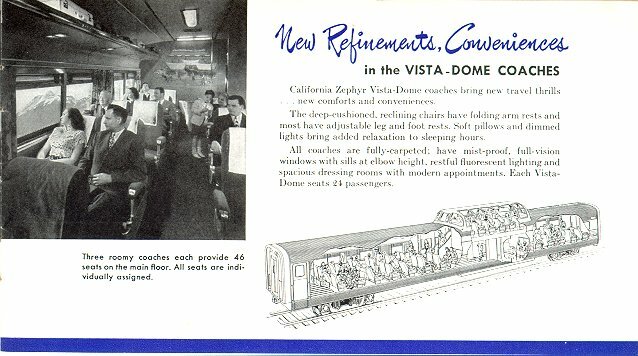 In each of these five air-conditioned Vista-Domes, enclosed in heat and glare-resistant glass, are seats for twenty-four passengers. 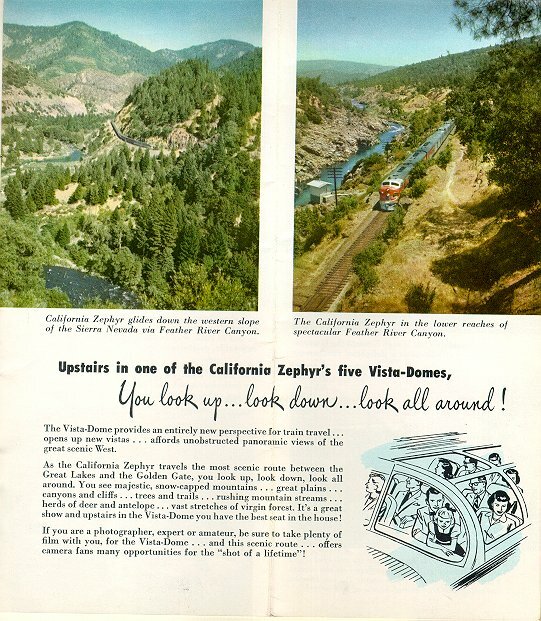 Here, passengers may rid in comfort and enjoy a complete view in every direction. 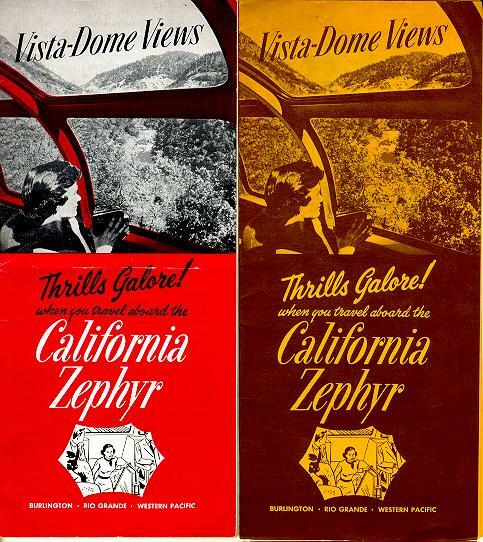 There is no extra charge, and seats in the Vista-Domes are not reserved. 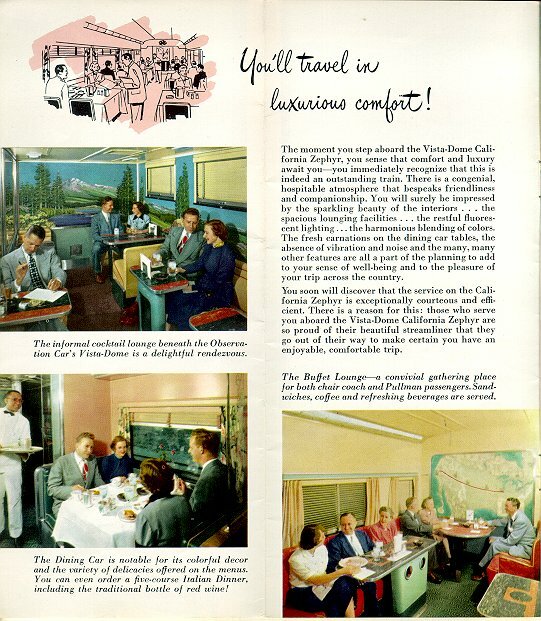 The California Zephyr is not an extra-fare train, but all space -- both coach and sleeping car -- is reserved and specifically assigned in advance." 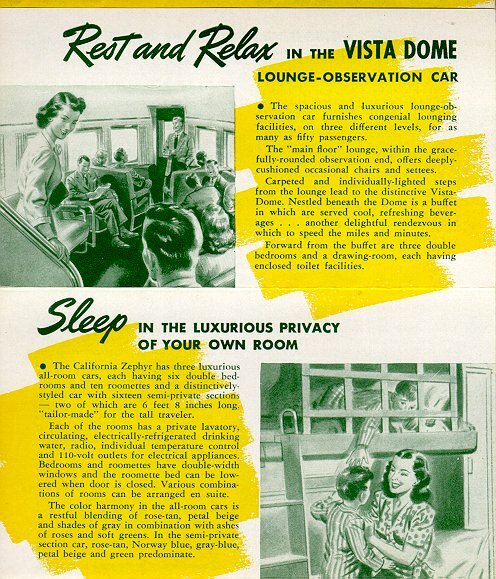 "Sleep in the luxurious privacy of your own room"
"This cheerful Diner adds zest to your meal"
"Sip and snack in the Buffet-Lounge car"
The Vista Dome Coaches..."New Refinements, Conveniences"
"To the West...To California...to SAN FRANCISCO" This 11 page brochure details many of the popular destination spots in California, the "land of superlatives". 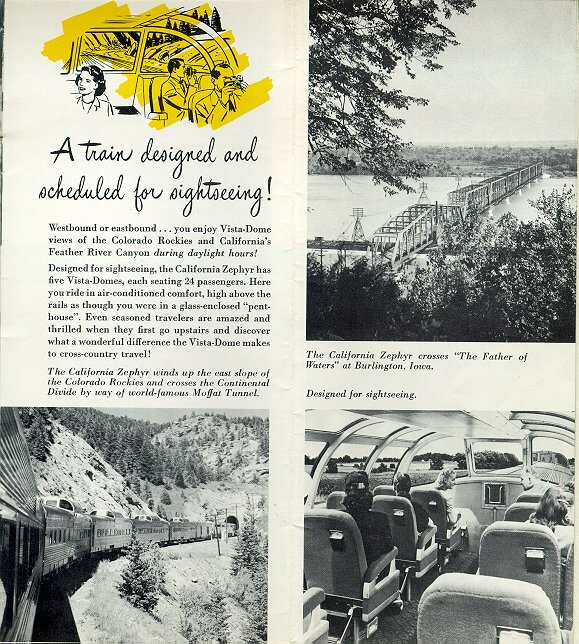 No printing date is present, but as it refers to the train as the "magnificent new" CZ, it was probably around 1949. 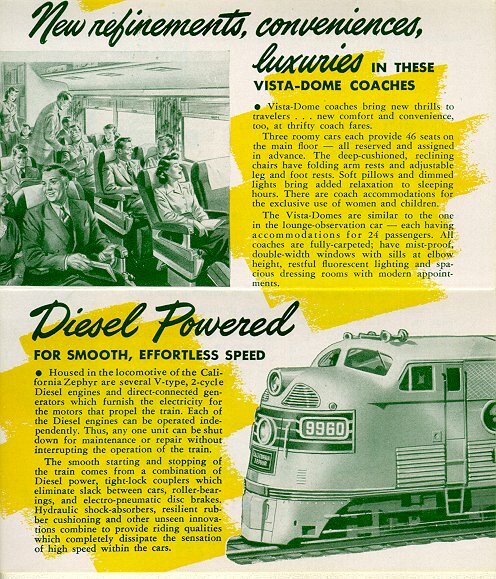 "The most beautiful, the most talked-about train in America!" 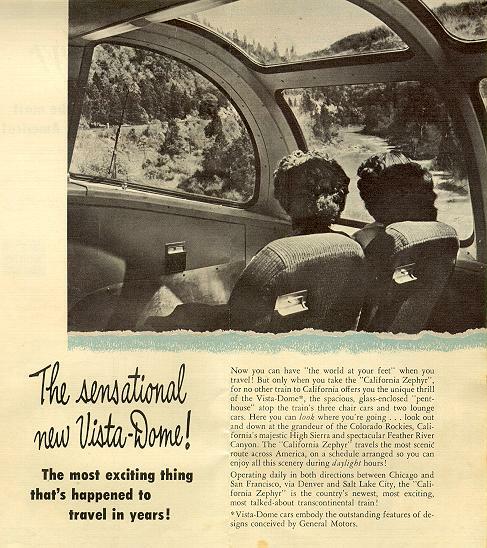 Inside the bi-fold. 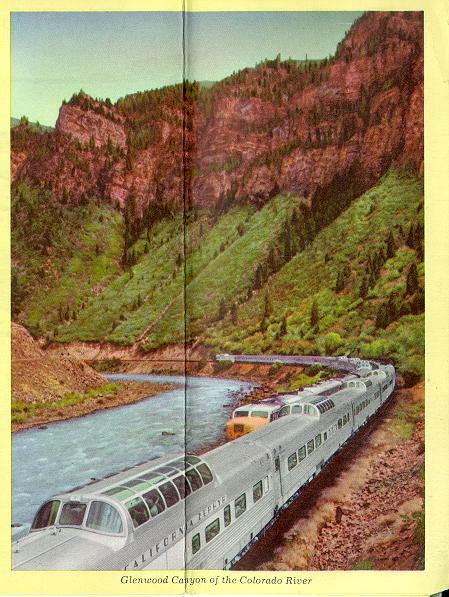 The California Zephyr -- c. 1950. 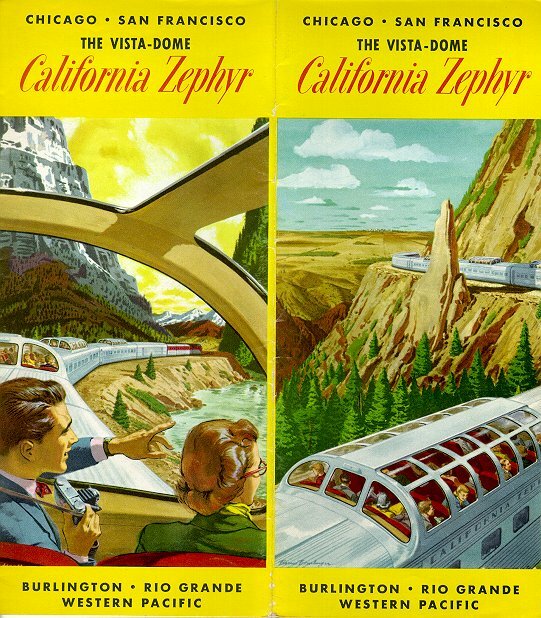 "...This booklet can only suggest the delights awaiting you aboard the California Zephyr. 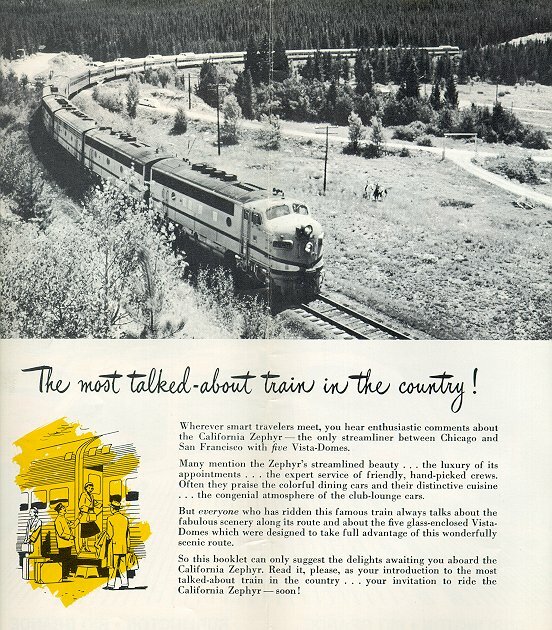 Read it, please, as your introduction to the most talked-about train in the country...your invitation to ride the California Zephyr soon!" 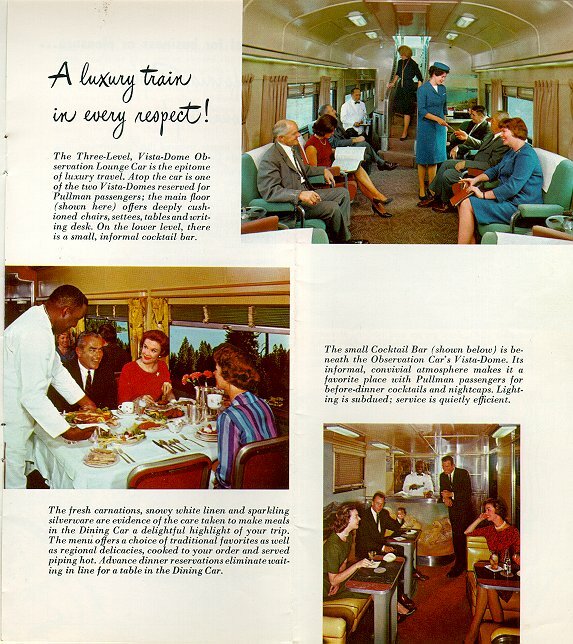 This 10-page timetable sized pamphlet describes the amenities of the train, including numerous color photos of the interior. 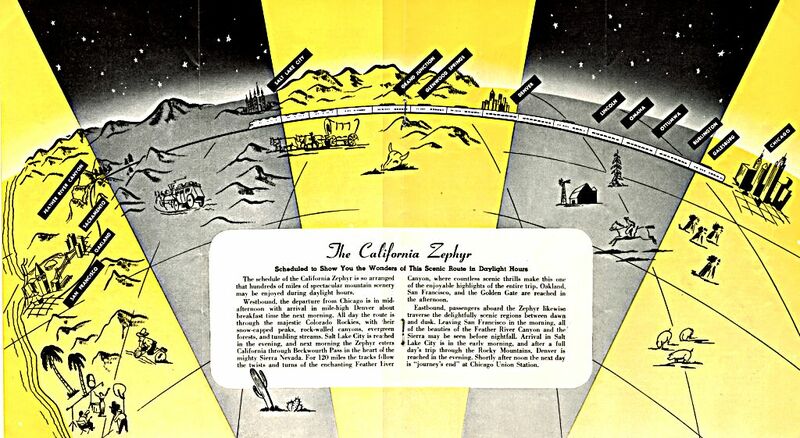 The date is not printed anywhere in this version. 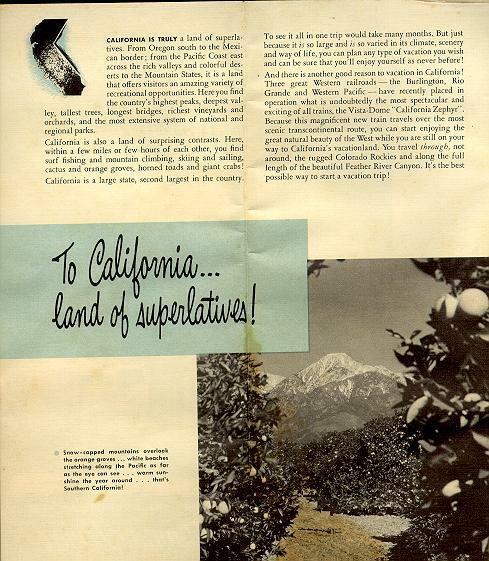 Meet at Glennwood Canyon -- Inside back cover. 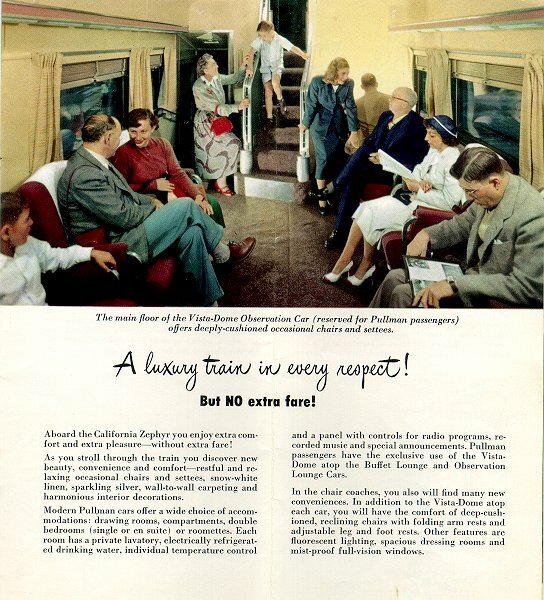 Note the "Aspen" color scheme on the PA-1s, which they wore only for a short while early in life. 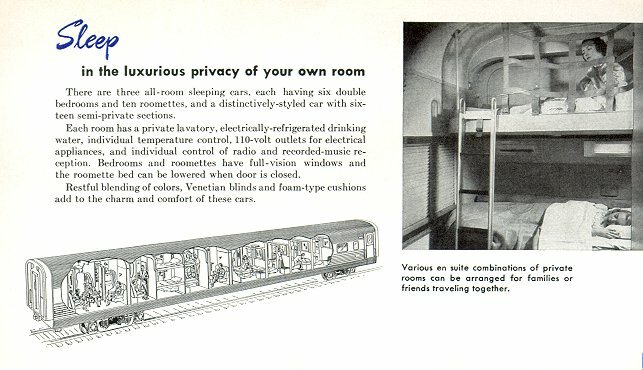 The Most Talked About Train... 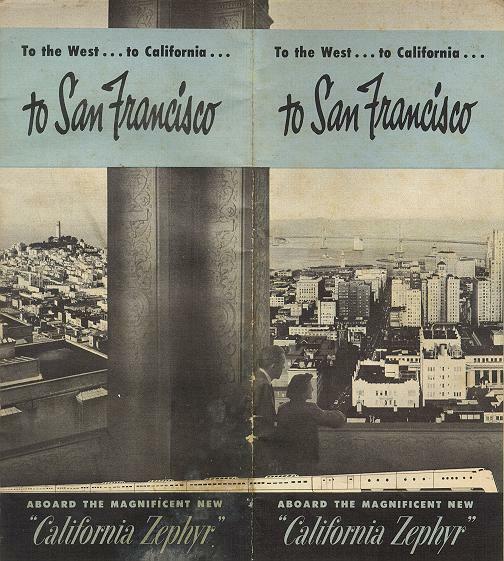 The first page, which contains the quote above. 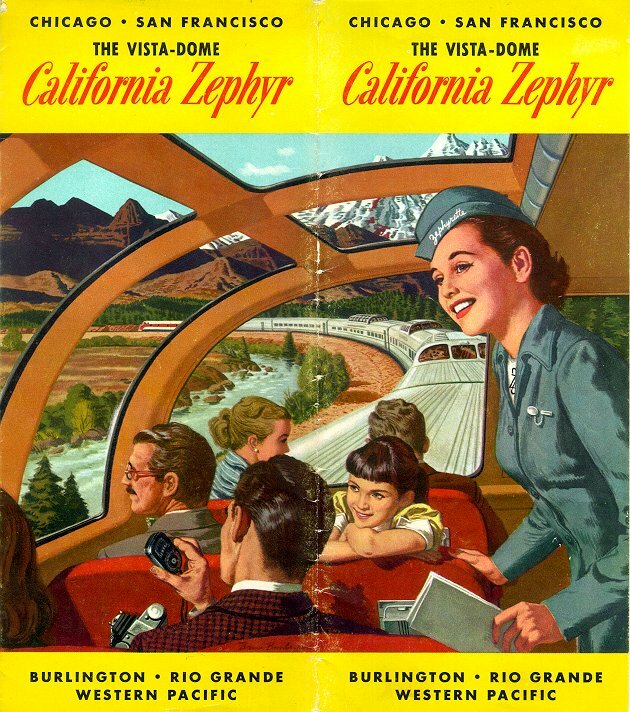 Look up...Look down... -- "The Vista-Dome provides an entirely new perspective for train travel..."
You'll Travel in Luxurious Comfort! 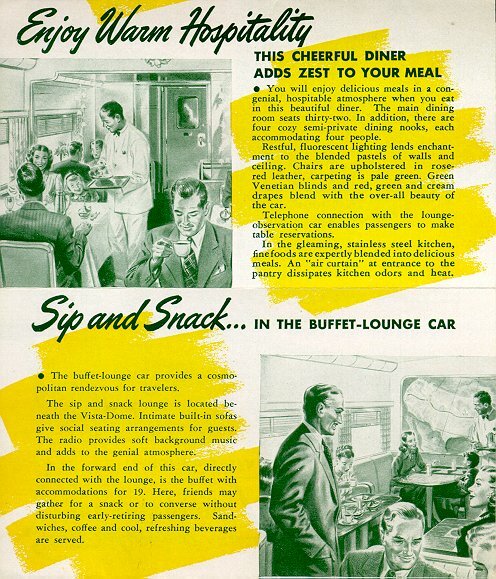 -- The cocktail and buffet lounges, and the diner. 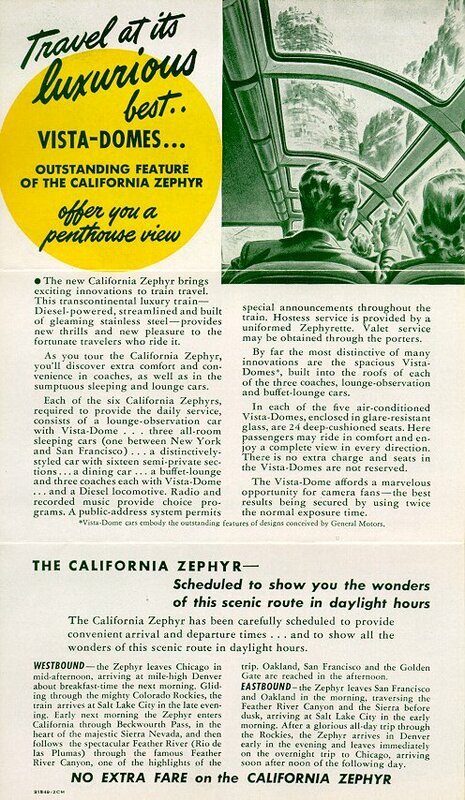 A Luxury Train in Every Respect -- A Zephyrette chats with passengers in the observation lounge. 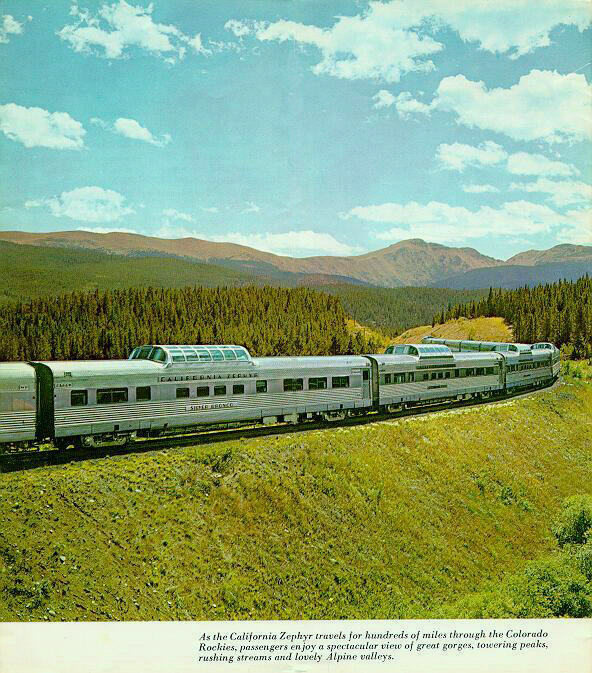 The California Zephyr --1960 An updated, expanded (to 15 pages) version of the above brochure, with the additional pages containing photos and descriptions of San Francisco, Southern California, and points in between. 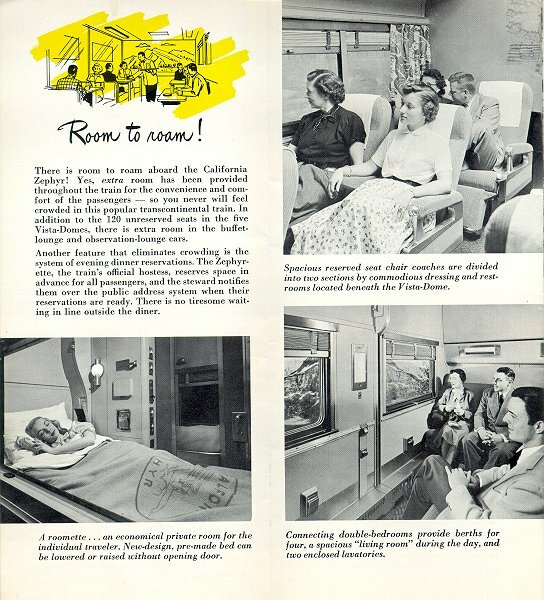 As for train-related content, it is almost identical to the above version, with the exception of the last page, Room to Roam. 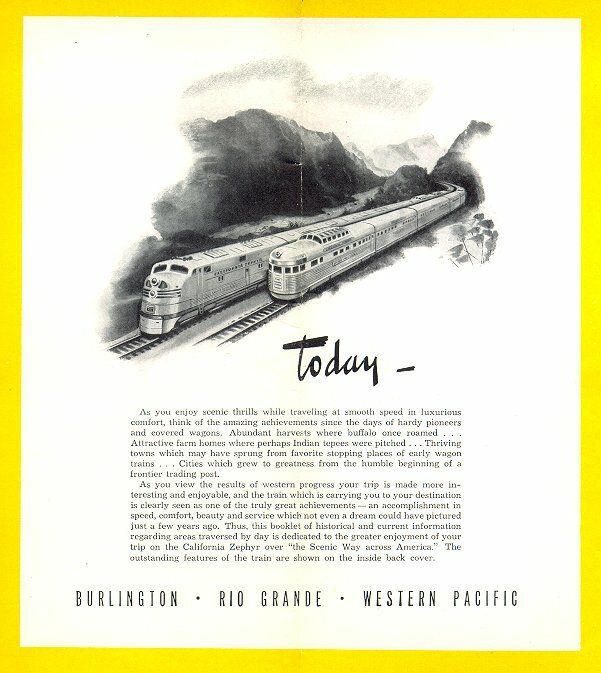 Printing date of May 1960. 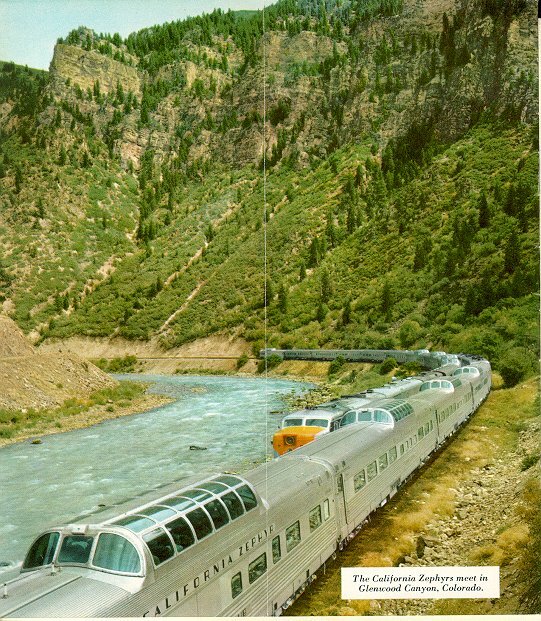 The California Zephyr -- 1967. This is a further updated version. 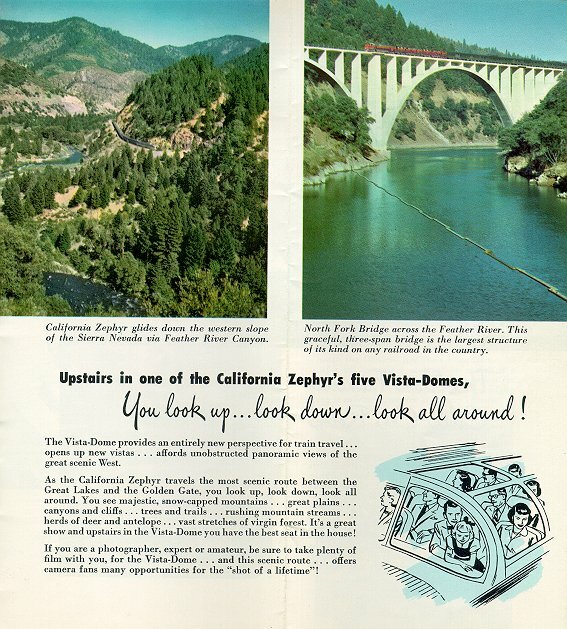 Many of the pages are the same, especially the tourist info. 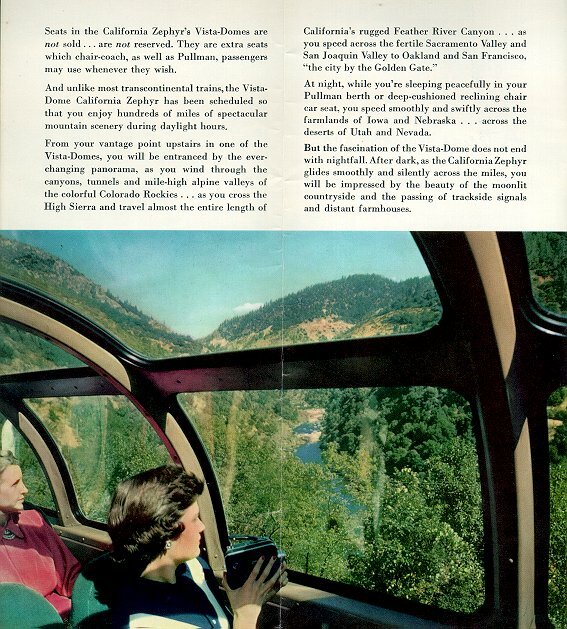 Photos of the train have been updated, including the new Cable Car Room. 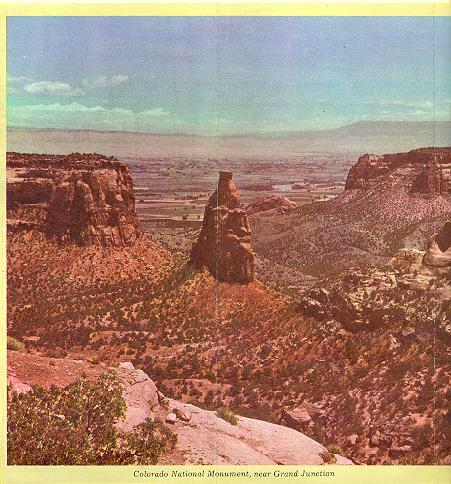 Printing date of March 1967. 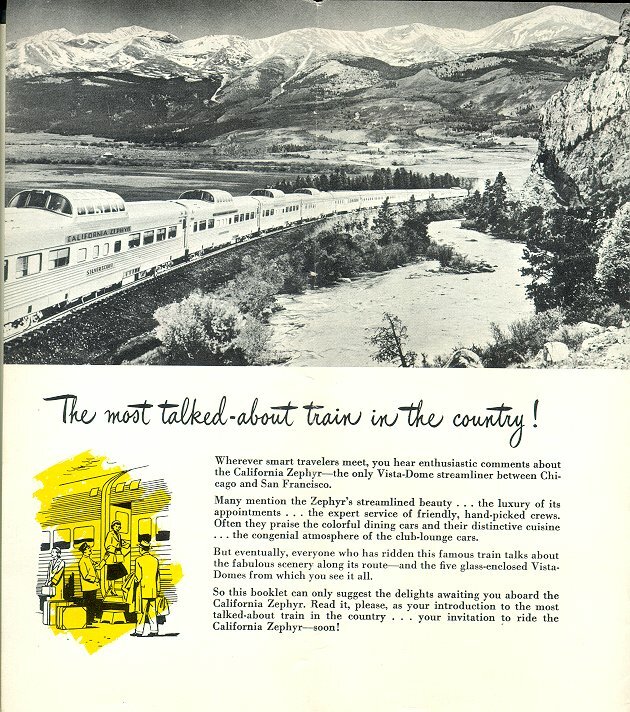 The Most Talked About Train... -- First page, with scene of the CZ at Winter Park CO...but look closely...this negative of this stock shot has been reversed! 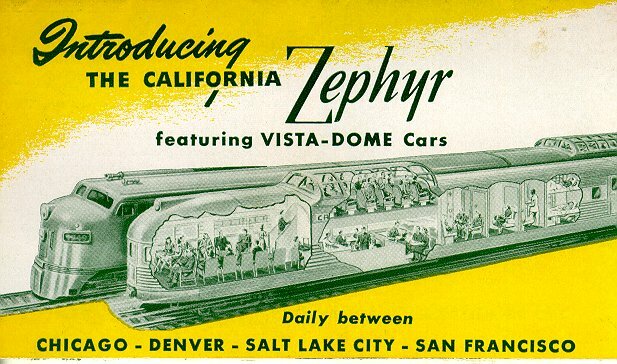 A Train Designed and Scheduled for Sightseeing! 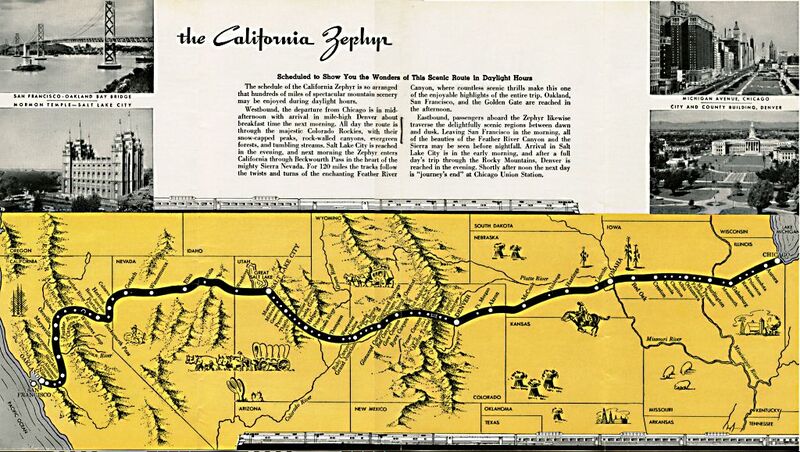 These time-table sized pamphlets are a trip guide, giving paragraph-length descriptions of each of the stops, as well as all the scenic highlights along the trip. 1953 Edition The 1953 edition is not as extensive as the earlier ones. 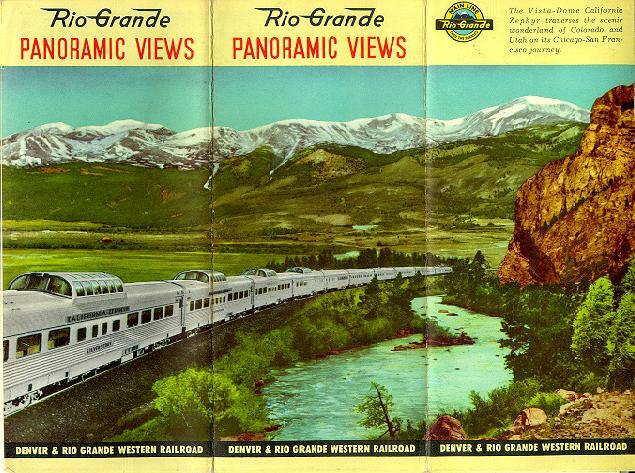 Rio Grande Panoramic Views The D&RGW had been publishing pamphlets called "Panoramic Views" since the early 1920s. 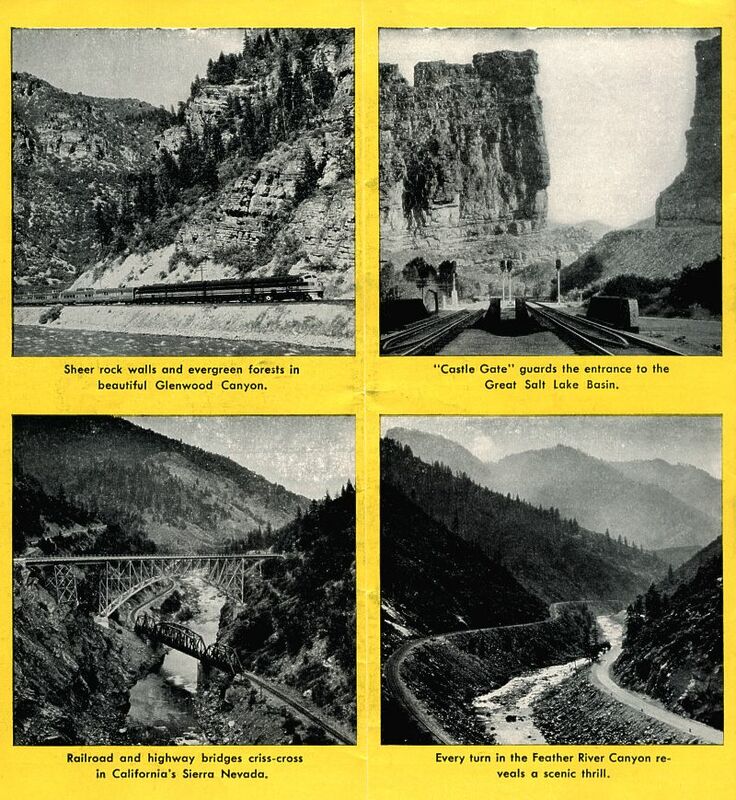 These unfold into long portfolios of Colorado scenery (and are a true challenge to refold!). 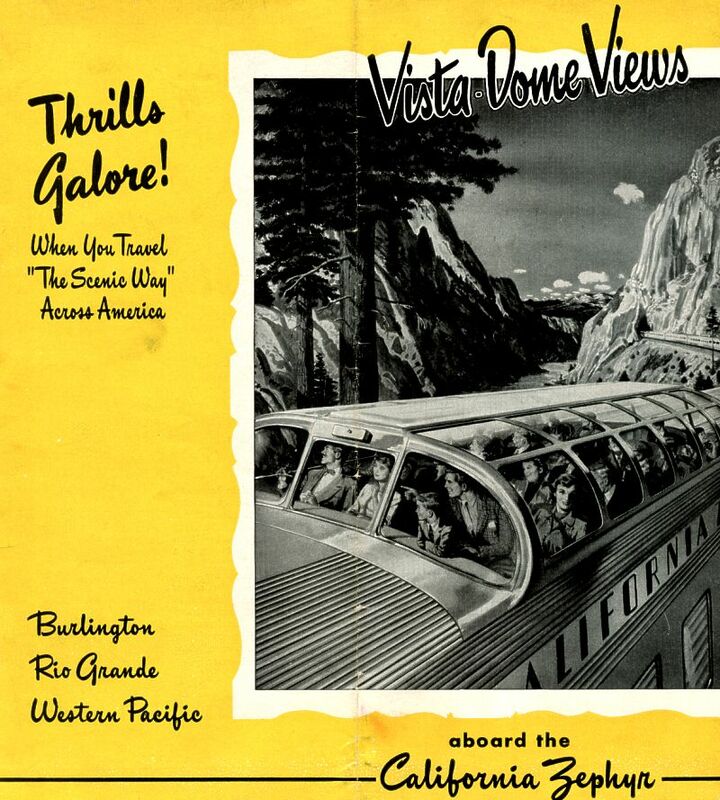 This undated version, probably from the early 1950s, opens up to 3 feet, 8 inches, and features the CZ on the cover and in one interior panel, the rest showing scenic vistas and other D&RGW trains. 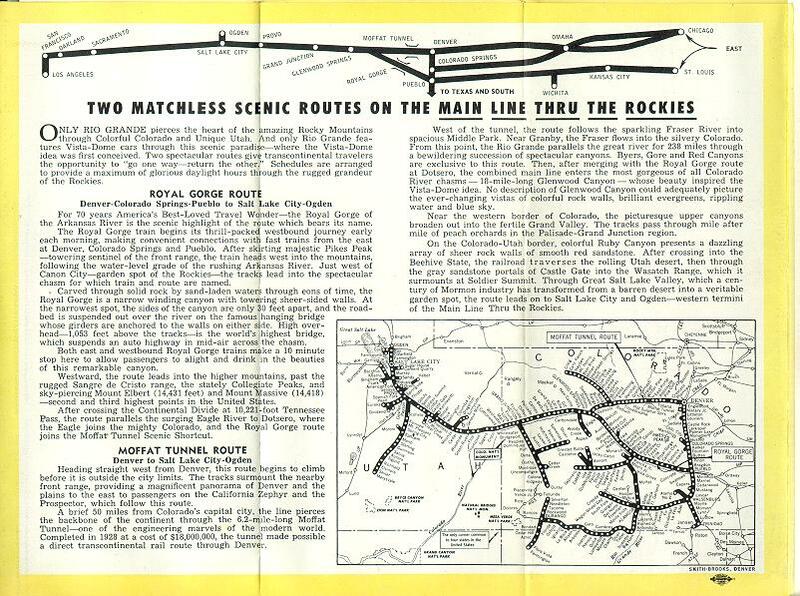 Two Matchless Routes on the Main Line Thru the Rockies. 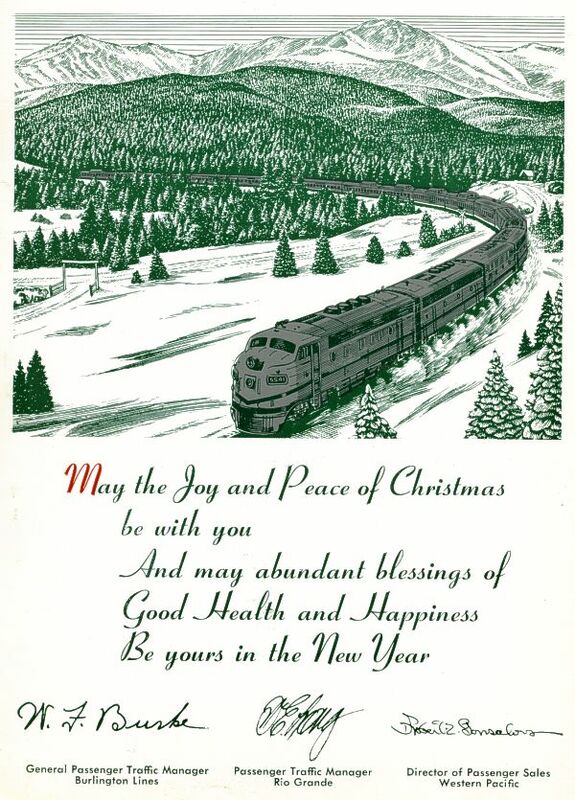 Christmas Card -- Metallic silver over green...a gorgeous card.